Android N name: Now's your chance to vote! Last year, Google CEO Sundar Pichai hinted that the Android N name could be decided by public vote. Now it looks like the company is testing the waters with a new Google Opinion Rewards poll. 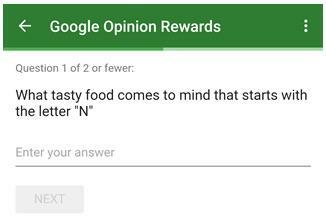 The poll, which was published online by Android Police, asks Android users to pick their favorite food that starts with the letter N. The first question is a fill-in-the-blank where you can type in whatever you want. 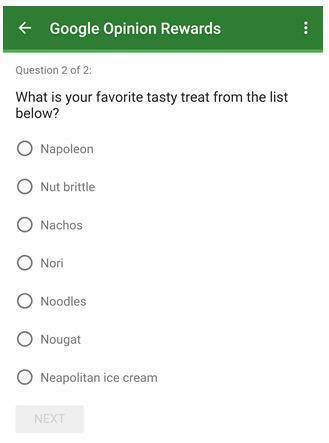 The second question offers a list of choices, potentially revealing the most popular Android N names currently under consideration. There are two interesting things about these options. First, early fan favorite Nutella is absent, suggests Google won’t be pursuing another cross-promotional deal like it did with Android 4.4 KitKat. Second, the list includes both sweet and savory foods, which could mark a departure from the usual dessert theme. Of course, there’s no guarantee Google will actually pick the next Android name based on this poll. But, if you want to have some input, you might as well fire up the Google Opinion Rewards app and check to see if the new poll is available.